We’ve already seen a solicitation and cover for one of the Flash issues in January, but now DC has released their full complement of issues for that month. Read on, and you can see the full lineup at Newsarama. In December the Titans solicitation threatened the end of Wally West, but he clearly survives to fight another day. So that’s good news! Plus, an adventure with the Rogues. So all in all, January sounds like it’ll be interesting. This entry was posted in Flash News and tagged Solicitations on October 17, 2016 by Lia. 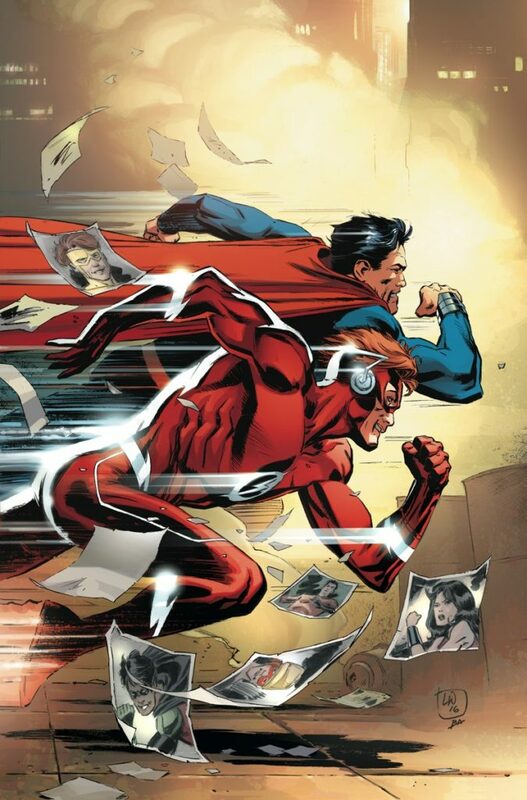 Clark and Wally coming face to face has been the thing I was mOST curious about in the new era. Will Clark remember Iris and Jai? That’s what I wondered a few Months ago. would Wally and Clark actually recognize and remember each other as Pre-Flashpoint selves. This is an issue I’m really excited for! Didn’t Wally beat Clark when he was looking for Linda?